With all the half-truths and misinformation floating around the web about the social upheaval that has been raging through Venezuela for the last few weeks, the mainstream media would have us believe the entire country is erupting in outrage, demanding an end to chavismo, Bolivarian-style socialism and a direct path back to cutthroat capitalism; which would be fine—it’s their country—except for the fact that it’s not totally true. 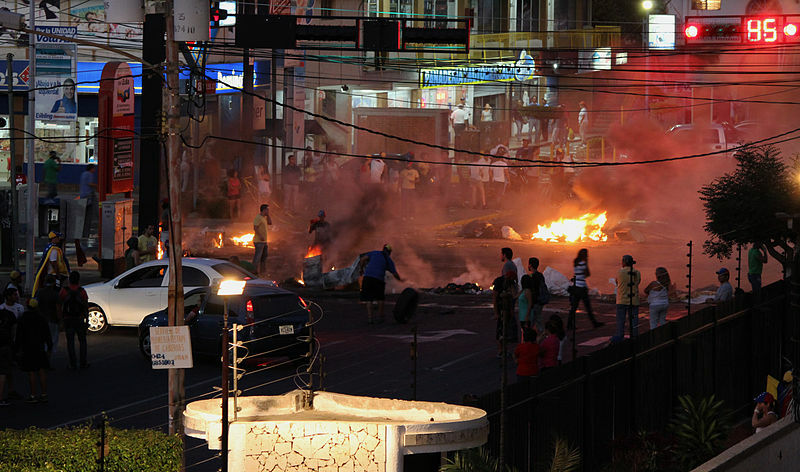 On the one hand, the Venezuelan uprising is about bread-and-butter issues. Inflation has been skyrocketing since before Hugo Chávez’s death. Crime has all but paralyzed the country. Shortages of goods have become a fact of life. But on the other hand, it’s about political power for the relatively “privileged” middle classes—you won’t notice many low-income people out in the streets, as they are generally content with the improvements in their day-to-day lives, post-Chávez. Since Nicolas Maduro narrowly defeated Henrique Capriles, it’s become obvious that Maduro’s star doesn’t have quite the shine-power Chávez’s did (homeboy has no personality), and his unpopularity has become a weak point for the conservative opposition to chip away. The right-wing leaders attempting to guide these uprisings are exploiting protestors—in much the same way the chavistas have in the past—by channeling their anger at the country’s economic situation into a lever for dislodging Maduro and claiming power for themselves. This much is clear: The opposition cares as little for the Venezuelan people as the current government, and given their politics, maybe even less. One of the opposition leaders, the wealthy U.S.-educated economist Leopoldo López, was a key player in the failed 2002 coup that attempted to topple the democratically elected Chávez. If someone like this clown comes to power, protestors will be back rioting in the streets within months of the elections. Now, I’m not going to tell you why these things are happening in Venezuela in a blog of a few hundred words. It’s impossible. And really, how can any of us be sure of the whys? And I’m no chavista. Repression and censorship are not the way to carry out a “revolution.” Neither are mass arrests of protestors or intimidation. The government has an atrocious record when it comes to interacting with the indigenous population. (The student movement released a six-point list of legitimate demands that cover most of these issues, which the opposition almost immediately hijacked for its own list.) There is a LOT wrong with chavismo, but it’s not so much the “OMG scary socialists hate money” angle as it is the one issue that plagues left-wing governments everywhere: they are as perversely eager to cling to power at all costs as their ring-wing counterparts. But I’m also not in favor of turning Venezuela into another haven for international business interests that will destroy the good that the Bolivarian project has done, and replace its evils with much of the same under a different party’s banner. The country would benefit from a more radical framework that wrestles the power from the chavista government and places it firmly in the grasp of the Venezuelan people, not from a return to free market chaos. What I do know is that the U.S. and others in the West are exploiting Venezuela’s tumultuous growing pains. Like they did in Cuba after the revolution. And in Iran in 2009 and Libya and Nicaragua in the 80s. Keeping that in mind—and speaking generally—who tends to benefit from middle-class led, elite-supported “movements” in nations where the ruling party’s government is either, one, vehemently opposed to Washington’s policies, or two, an embarrassment for our government to continue openly supporting? If you said the United States, go to the kitchen and get yourself a cookie. So as legitimate as some of the complaints—and as terrible as the violence has become—are, when you say: “We’ve got to save Venezuela!” you’re actually lending support to the already-alluded-to idea of a U.S. intervention in Latin America. Which, hello, is a terrible idea. Were you alive in 2003? When our government sets about on its “democratizing” projects, death and destruction tend to follow in its wake. And please ask yourself: why is the U.S. so interested in the uprisings Venezuela and Ukraine, but not in the anti-government protests in Bosnia? All the U.S. needs is an excuse to intervene in Venezuela. Do we really want to give them the pretext they’re looking for?